We have been talking about it for some time now and, finally it is upon us. Tonight at 6:30pm the Bikestravaganza sets down here in Provo at the Provo library. At the event there are going to be slideshows, short films, and a traveling library all dedicated to bicycles. Best of all the event is free. If you would like (we strongly recommend) you can make a donation at the door. We are very excited for this event and hope that all of you can make it out. See you tonight. Yes, We Are Still Alive. With the end of summer we have all been starting either new jobs or new semesters. It is good to be back now that things have leveled out a bit. We have had a ton of emails with suggested material so, with out further waiting , here is what you have been missing. 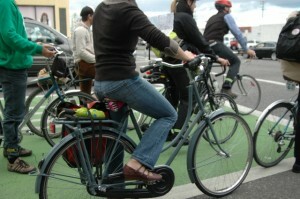 To start with there is a great post over at lovelybike about proper bicycle/clothing protection. It is sad that we do not see more of these accessories come stock on bicycles. However I have a pattern for the skirt guard idea if you are interested just let us know. Moving from form to function there were two great advocacy articles that have been put out. One that comes by way of EcoVelo is a scientific study that shows the health benefits of active transportation. I think that we all know that bicycle riding two miles as opposed to driving two miles is going to have health benefits. However, the interesting thing is that at the end of the article the researchers petition for more attention and money to be spent on active transportation. 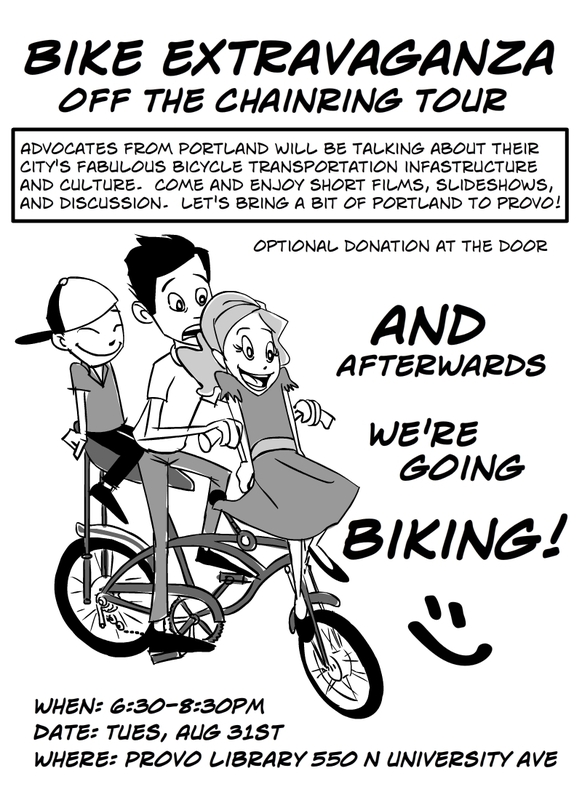 The second advocacy piece comes from BikePortland. This is a great piece on the benefits bicyclists have on local economies as long as they have safe access to the areas were they can spend money. If you know anyone downtown that should read this article make sure to send it over to them. This last link is just a way for me to coupe with my jealousy. Copenhagenize decided to show off and map bicycle shops that are within 7 minutes riding distance from his house. He came up with 27 neighborhood shops and even admitted that he might of missed some. I am not sure if there are even this many shops between Provo and Salt Lake. Hopefully you will find some fun stuff within the links then do like I do and spend an hour or so learning something new about bicycles. On that note our very own Trevor Christensen went to NYC a few weeks ago. 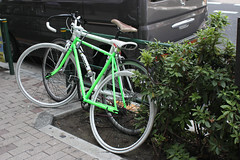 He ended up at Rapha (check out the continental ride videos) and got to take pictures of the ever witty BikeSnobNYC. You are a lucky man Trevor a lucky man indeed. I hope that this weekend treats you all well and that you continue to have smooth rolling as Fall (also known as the best season ever) gets closer and closer. p.s. Dont forget about the Bike Extravaganza happening this coming Tuse. at the Provo Library. The recently passed Provo bike plan has gotten quite a bit of good press in the last few days, including articles in the Salt Lake Tribune and Daily Herald. “The Municipal Council’s recently approved General Plan includes a provision for tripling the amount of bicycle lanes and paths from 18 miles to 56. The goal: win the coveted gold-level status from the League of American Bicyclists. “Now there is a plan in place, Whitmore said they can apply for a grant from “Safe Routes to School,” a federal biking program. Congrats, again, to the Provo Bicycle Committee for their support and the Municipal Council for passing an amazing bicycle plan for our city. Monday Ride Report 8/9-8/15 Share Your Cycling Experience. Come on, you know you’ve had some sort of biking experience this week. Go somewhere fun? Find a new path? Get into some trouble on the road? Run over a squirrel? No matter how big or small, we want to hear about your cycling week. Help make this feature successful by writing a comment! Good morning everyone! This week has had some great rides and some great times with friends (Brad I’m looking at you). 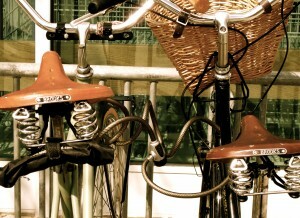 I love the way that the bicycle connects us with other people. It does not matter if you are a commuter, spandex warrior, or dirt jockey. It seems that when you are on a bike and enjoying the day you can not help but share the experience with who ever will listen. This does not necessarily mean that you strike up a conversation with someone it can be as easy as ringing your bell in happiness to who ever is listening. It is on this note that I will report on this week. Last week I was heading home from work on my beach cruiser. I usually do not ride my cruiser to work but due to injury have had to ride it more since it is upright sitting and has a coaster break. As I was coming down the hill on University Parkway some one on a fixie passed me I did not think much of it and just kept cruising along. We both met up at the light at the bottom of the hill. I noticed he had a pretty nice bike and told him that. 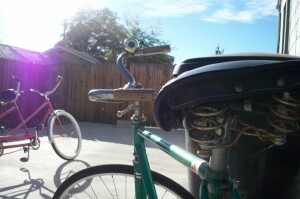 From there we started talking about my cruiser and bicycling in general. As we spoke the light began to turn green and I figured that this conversation would end when the red light did. To my surprise the other rider continued to ride with me for a good 1/2 mile or more before we split. He could have easily taken off and got to where he was going way faster instead we cruised along talking about the fun and dangers of commuting by bike. This ride stuck out to me because I was able to make a connection that never would have happened in a car. To me this ride highilights some of those special benefits that come from using a bicycle for transportation. Not only are you getting from point A to point B while getting exercise but you have more chances to connect with your surroundings whether that be environment or people. I hope this week will give all of you an opportunity to connect with your surroundings in some way. Whether that connection be talking with a stranger, finding a shortcut, noticing an improvement that can be made, or simply noticing some flowers you have never noticed before. Also, please take the time to comment on these reports. We have heard a lot of feedback saying that many of you like these reports but, the only way that they are really successful is if you add your experiences. For many of you school will be starting soon whether you are a professor or student I hope that you take advantage of your last bit of free time and get some awesome rides in. 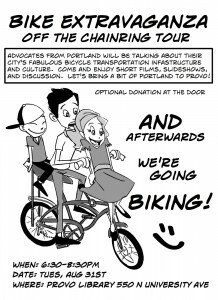 Mark your calendars, Portland’s traveling group of bike advocates is making a stop in Provo for one amazing night! The Bikestravaganza event will feature an interactive multimedia discussion about bike culture, a traveling bicycle library including hard-to-find zines, books, and movies, and the chance to make new friends with some incredible people. After the event, we’ll head out on a celebratory bike ride to a mystery destination. When: August 31, 6:30 – 8:30 p.m.
Our visitors, cycling activist Elly Blue and Microcosm Publishing founder Joel Biel, define the event as “an interactive, multimedia traveling roadshow bike summit coming to your town…with bikes, movies, zines, books, debate, and problem solving. Our goal is to bring together the diversity of big cities’ bike scenes, whittle away at the loneliness of the small town bike activist, and to have a blast meeting, inspiring, and learning from people in the bike movement outside of Portland.” Sounds like just what Provo cyclists need! The event is free and open to the public. We will happily accept donations to help offset the traveling costs of our fine cycling friends from Portland. Take a look at the Facebook Event and don’t forget to tell your friends! This will definitely be a night you won’t want to miss! Photo above: Bicycle traffic in Portland, Oregon pauses in one of the city’s green bike boxes. Photo credit: Elly Blue. Provo Working to Become Gold-Level Bicycle City & Add 60 Miles of New Bike Lanes! Amazing things are happening for bikes in Provo thanks to the city council’s decision to include bike-friendly policies in the general plan. After such an impressive showing of bicyclists at last week’s city council meeting, the council voted for plan that will help Provo in two HUGE ways. Zac’s post Council Meeting a Success discussed the outpouring of support from local cyclists and the council’s positive reaction. Today’s post will give a quick overview of what the new plan means for our city. 1. Provo Will Seek Gold-Level Bicycle Friendly Status. The League of American Bicyclists recognizes cities that make an effort to be friendly to bicyclists by doing things like providing bike paths, ensuring bicycle safety on the roadways, and offering accessible bicycle parking at public places. 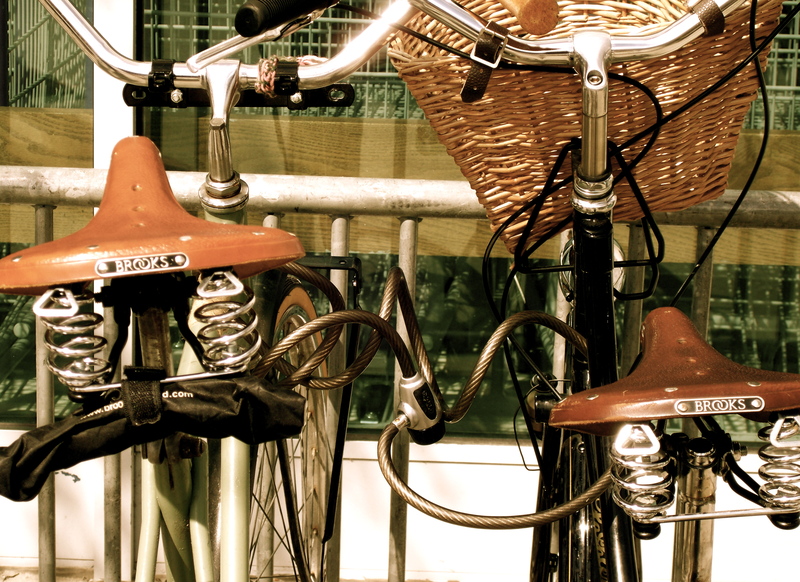 Both Salt Lake and Park City are currently recognized as bicycle-friendly communities. 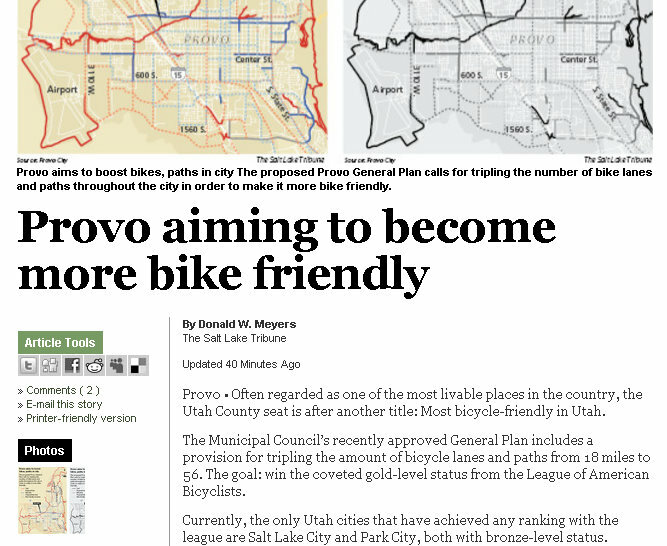 Now, Provo will be working towards reciving gold-level status by making sure that bikes have a place in our city. 2. Provo Will Triple the Number of Bicycle Lanes. 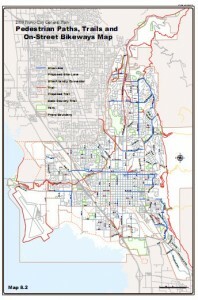 The council unanimously voted to include a forward-thinking bicycle map in the general plan. 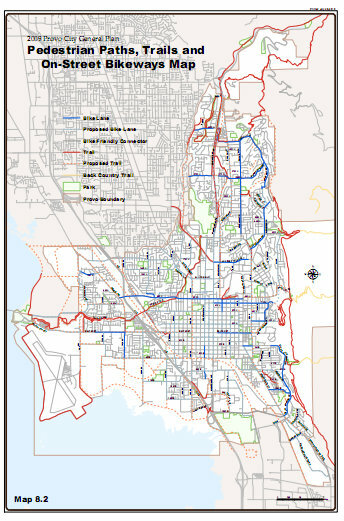 Going by this map, the city will essentially triple the number of bicycle lanes throughout Provo. Additionally, it will add more pedestrian pathways and trails. The bicycle map is a very big deal and it will dramatically improve the ability for cyclists to get out and enjoy the city safely. We expect that these two changes will dramatically improve the quality of life in Provo, ease traffic congestion / parking problems, and make the downtown area an even better place to live! This is good news for our city – please, pass this along to your friends and family so they can share in the anticipation of the incredible projects coming to our town! Join the Provo Bike Committee for their bi-monthly meeting to help advocate for bicycle lanes and plan some really amazing events for the fall! There are a lot of exciting things happening right now and a lot to celebrate since the bike lane plan passed at last week’s council meeting! This is your chance to get involved. When: Thursday, August 12 from 5:00-6:00 p.m.
Everyone that lives in the valley or is interested in bikes or just feels like sitting in is invited! Seriously, that means you. 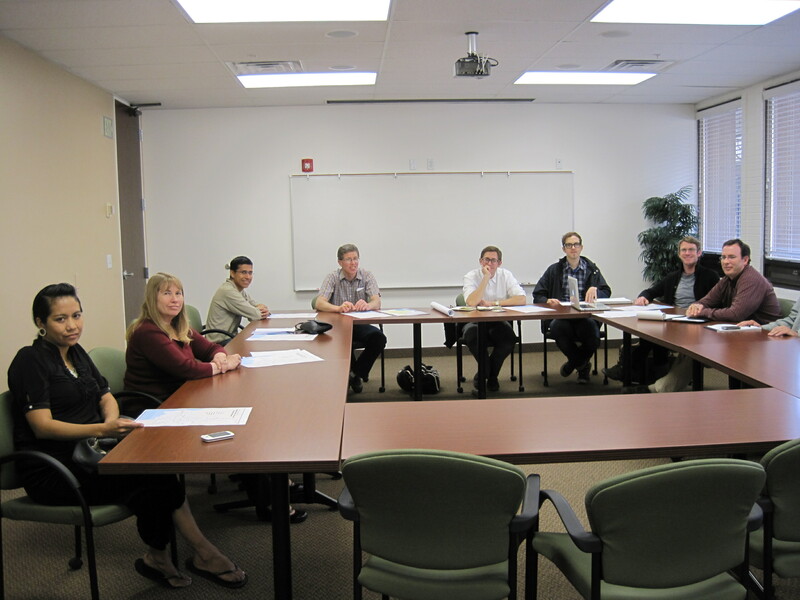 The Bicycle Committee meets in the Municipal Council Room on the 2nd floor. Learn more on the Bike Commitee Meeting Facebook Event or the Bike Committee website. This weeks ride report is being hijacked for a very worthy cause. We still encourage you to write your reports in the comments section (that’s where you will find mine). Provo is being visited and honored by some great people from Portland OR. The Bicycle Extravaganza Tour will be coming through Provo on August 31st. We are not sure at what location yet but we have been provided with this awesome video that will give you a taste of what is coming to Provo. Make sure to mark you calendars. Here’s a tasty trade: bring your old bicycle to the Provo Red Robin and you’ll be given a coupon for a free burger on your next visit. The donated bikes will be given to local families in need by Catholic Community Services of Utah. 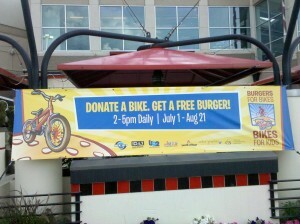 Know of another bicycle-related promotion or discount for cyclists? BikeProvo is happy to promote local business that support the cycling community. 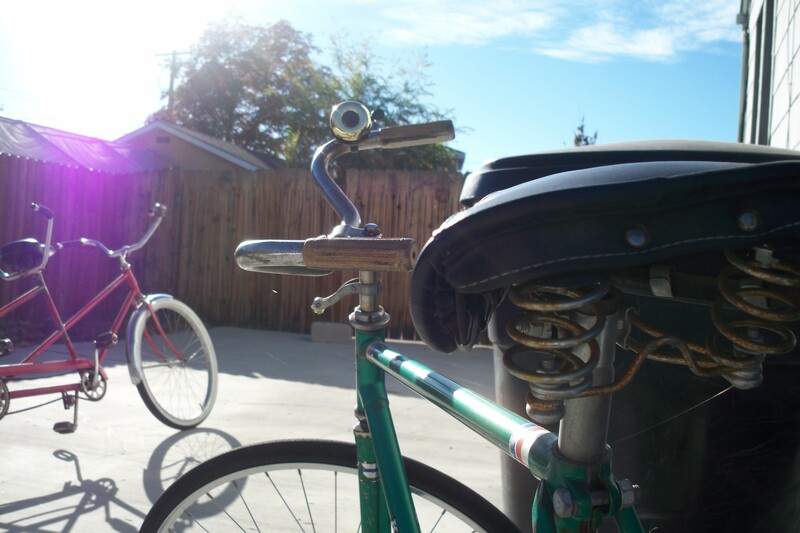 Email: bikeprovo @ gmail. The last Critical Mass of the summer will be held tomorrow night. When: Friday, Aug 6. 5:30 p.m.
Critical Mass is a celebratory group ride, and cyclists of all ages and skill-levels are invited. To learn more, visit their Critical Mass Facebook event page.